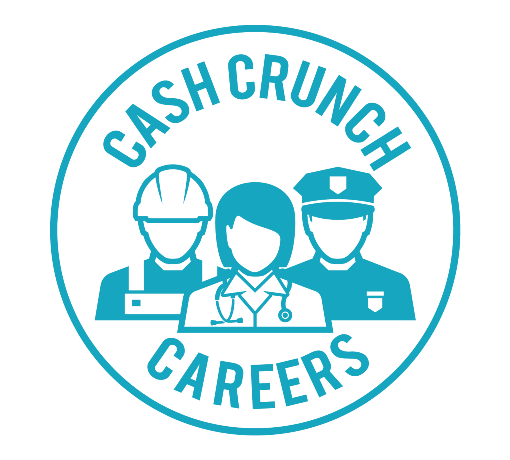 We were recently invited to review CashCrunch Careers by CashCrunch Games. Now you may be asking what in the sam-hill is CashCrunch Careers. 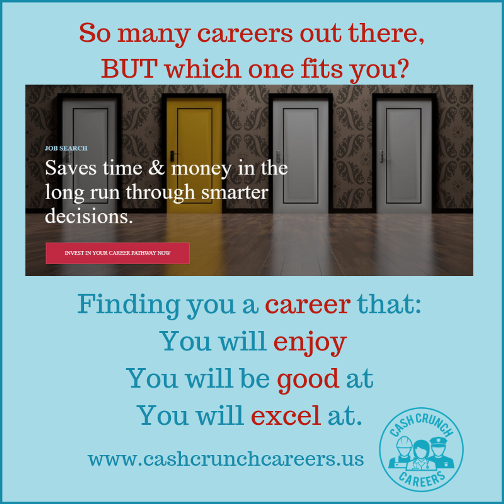 Well, my friends, CashCrunch Careers seeks to pair you with your perfect career path. Their philosophy is simple. They believe we choose our career path backwards. They state that currently, we get qualified for a career-THEN find a job. They believe we should find the job we fit first, then seek to get qualified for that chosen path. For this review, we received three codes, so three of us could take the survey-Mr. B, my self and my niece. When I was a little girl, I had all sorts of career goals. I was going to be an award winning chef working at the local hospital who made bologna sandwiches for everyone. Then I was going to be an Olympic ice skater. After that it was a meteorologist until I found out the local university did not offer that. THEN a doctor, but I'm allergic to the chem lab, finally a lawyer. Have you any idea how expensive law school is?! The point is, I was all of the place with no real direction, no real path. I ended up getting my Bachelor's in Sociology and minors in criminal justice, history, French, and meteorology-because of course NOW they offer that degree. So I took my survey. The Survey is EASY! There are 75 questions, but they aren't questions. You are to pick one of two words on each line that you feel best fits you. It's important that you don't choose the word you WANT to be, or the word others may think you are, but the word you truly are. This was kind of hard for me. I found myself being rather wish washy with a few because both words fit equally, or didn't fit at all. I'm ALL of those things! I did like how you could see where you were in the survey with the little bubble sheet like counter there on the right hand side. this survey took me less than 10 minutes to complete. When it was finished, I had my report instantly. 1.) I am the leader of most groups. I do question the regular way of doing things to see if I can find a better way. I will question myself and my choices, continually, to see if I can come up with a better place. The survey got that right. 2.) Career Attributes got me 100% wrong. I hate routine and the same thing all the time. I can't function with out change, especially changing work environments. I don't even like doing photo sessions in the same locations over and over again, preferring to space my time out in each place because I thrive on change. I also do not like having a supervisor type around me all the time. That's too much pressure for me, and I prefer to work on my own. 3.) I like the jobs list, and I like that I can click on them to see what they are. I was surprised by "Farmers and Ranchers" as an option given the previous work environment suggestion. There are always changes and unexpected events on farms and ranches, so I'm not sure how that fits exactly. Overall, for myself, I didn't really feel any of this was any different than my original thoughts. I prefer to take the lead and be the leader. I have never been a follower, and this survey did point that out, accurately. I will not post his entire report to save space on this blog so you don't have to do a ton of scrolling. His report basically says he is creative, intelligent, and thinks things through in a logical manner. These are all true attributes that would accurately describe Mr. B. What was most interesting was seeing is choice of words to describe himself. I would have chosen completely differently for him, thus giving him a different outcome. This goes to show that as parents, we need to be more supportive of our children and allow them the space to choose their own career path, and not the path we want to choose for them. As you can see, the careers are the same, but they are arranged differently. They are arranged in order of how well the program deems they will fit a surveyed personality. I am surprised given the emphasis on creativity that there are no graphic arts type careers listed here. Again, I'm not going to post the entire report. To summarize, CashCrunch Careers says K works well with others. I would agree with this, as she does work pretty well in groups and teams. It also says when things go wrong at work, her emotions can be hard to control. I would also agree with this, because she is a very sensitive and emotional individual. Her motivators and de-motivators seem spot on from my point of view. She works as my assistant with weddings, and much of the time it is because she is so good working with the people. She puts them at ease, she is eager to help out any way she can, and she's friendly. Again, she has the same list of careers, almost. When she saw Funeral Director listed, she lost it lol. Her order is just slightly different than Mr. B's, whose is slightly different than mine. Overall, this was a very fast (10mins or less for us) survey that tried to determine what our career path should be. K and I have both already graduated college, and Mr. B is only in the first half of 8th grade. But this still gives us some insight into potential paths for him, and maybe helps reassure that we took the correct path for ourselves. Mr. B really enjoyed exploring the CashCrunch Games website where he stumbled upon CashCrunch 101, a free personal finance game that he really likes. It is intended for high school and college students, and the lessons are short 30 minute lessons that you can easily squeeze into a busy day. There are other games, as well, so you may want to check it out for yourself. Please click the banner below to read more reviews by the Homeschool Review Crew. We were only one of several reviewers for this particular product, so I'd love for you to see what others have to say, too!